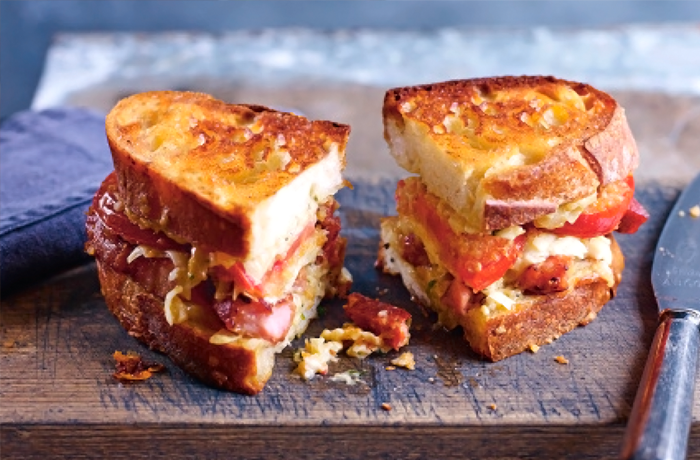 Long gone are the days when a cheese toastie meant two thin slices of supermarket bread and a slab of cheese. To maximise taste, why not try one of our exciting creations below? Melt butter in a pan and fry some sourdough. Spread both slices with mayo and a little mustard. Add sauerkraut to one slice, along with grated Parmesan, cheddar, roasted tomato and crispy beef bacon. Sandwich together and fry until piping hot and golden. Fry slices of white bloomer in foaming butter. Add grilled sausages, warm baked beans, a slice each of red Leicester and a slice of mature cheddar to one slice of bread. Sandwich the other on top and fry both sides until melted, golden and oozing. Put sourdough bread in a pan of foaming butter. Spread one slice with chilli jam, then sprinkle over grated Monterey Jack and cheddar, plus chopped pickled jalapeños. Sandwich the other slice on and fry until both sides are golden and the cheese has melted. Spread pesto on two sourdough slices that have been fried in butter. Add mozzarella, Gruyère and sundried tomatoes to one slice. Sandwich and fry until the cheese has melted and both sides are golden. Hey pesto! Slather barbecue sauce on slices of sourdough and fry the other side in butter. Top one slice with caramelised onions, American cheese and Gruyère. Sandwich the other slice on top and fry until the cheese has melted and the toastie is golden.